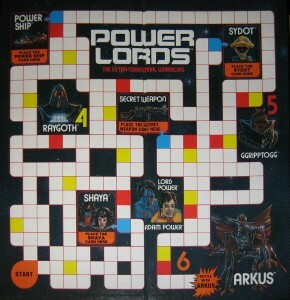 Power Lords Game Celebrates 30th Anniversary! Click on the photos below to expand the images from the vintage board game Strongin Mayem put out in 1983. You are Adam Power. Using the Power Gem you become Lord Power, a being of supernatural strength! The evil dictator Arkus, and his monstrous servants, Raygoth, the Goon of Doom and Ggripptogg, the four fisted brute, have taken over a starbase near the edge of the galaxy. Arkus must be stopped. You must make your way through the space maze, acquire a secret weapon, and gather your allies. Shaya, the Queen of Power and Sydot, the Supreme do battle with Ggr1pptogg and Raygoth and prepare for the ultimate conflict with the evil Arkus. Accept the challenge, fire up your powership and jump into hyperspace. Meet your enemies and drive them from the galaxy to win for all of us.